After suffering a final-fence fall in the Kauto Star Novices' Chase at the track 12 months ago, Might Bite gained deserved compensation to complete a Grade One double for trainer Nicky Henderson, who had earlier won the Christmas Hurdle with Buveur D'Air. Close to the pace throughout, Might Bite (6-4 favourite) hit the front rounding the home turn before digging deep after the last to hold off the challenge of Double Shuffle by a length, with Tea For Two a further two lengths adrift in third. Henderson said: "He is good to watch. You could enjoy watching horses like him all day and night. "He loves all the showmanship that goes with it and he likes to jump like that and boss it and say, 'Look at me'. The nice thing was that he handled the ground. "We have our little scheme which is try not to press before the last. Don't let him know that is the last then you can go for your life after it. "They (owners, the Knot Again Partnership) are a real fun team of mates. It is very special for us to get a horse like this and they deserve it." 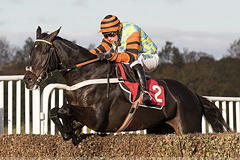 All roads for Might Bite now lead towards the Cheltenham Gold Cup, for which he was cut from 6-1 into 5-1 by Coral. Henderson added: "The next question is what we do next. We will probably have another run. "It won't be a slog in a bog, wherever it is. If it froze up until March 16, that wouldn't bother me. "Now we have got to behave ourselves at Cheltenham. Cheltenham is a different ball game and he will probably want to go right." 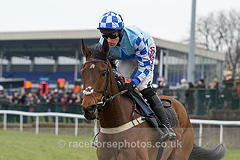 Winning jockey Nico de Boinville was full of praise for Might Bite after he cast aside his rider's concerns over the ground. He said: "He jumped the last as if he had plenty left and I think he was just idling slightly, if something had come at him I think he'd have gone again. "He's a delightful horse. I was a bit worried about the ground, having ridden on it earlier, but this was great." Tom George hailed the efforts of runner-up Double Shuffle, who outran his 50-1 price tag. George said: "Three miles on this track probably suits him best and better ground would help him as well. "I've not even thought about Cheltenham." Jockey Lizzie Kelly was proud of Tea For Two, and said: "To be that close to Might Bite - I have such respect for him - I'm absolutely thrilled and I could not be happier to be involved with him." Colin Tizzard was not too despondent with the performance of fourth-placed Thistlecrack, but was more concerned about stablemate Fox Norton, who was pulled up. He said: "I was delighted with the way he (Thistlecrack) has come there into the straight and he has run a hell of a lot better than Newbury. "The next time, or time after, he is going to shake them up. "Yes, 18 months ago he was being called unbeatable, but he had nine months of inactivity with his injury and it takes a hell of a lot to get them back - but we have him back on track now. "Fox Norton was never travelling, which was strange for a two-miler. He was jumping left so we will get him checked out next week."